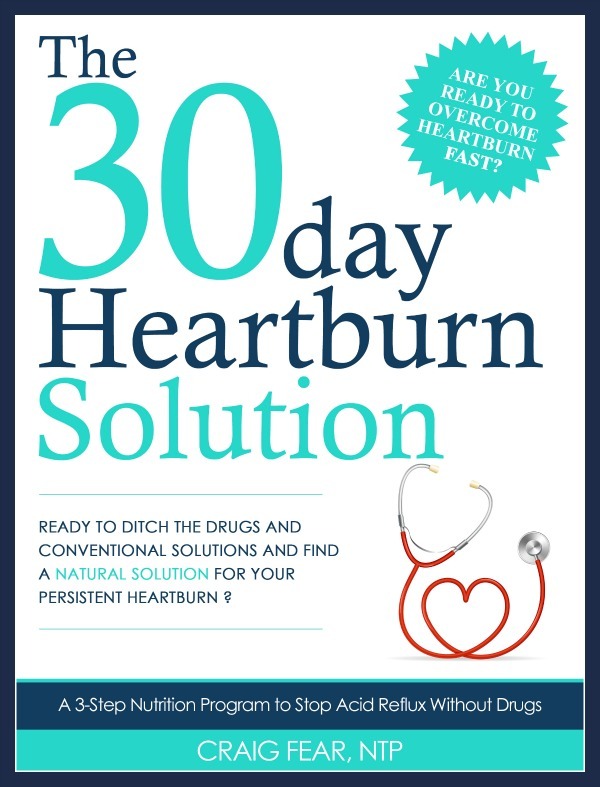 The 30-Day Heartburn Solution Now on Amazon! Today, I’m happy to announce that my first book, The 30-Day Heartburn Solution is now available on Amazon! And for the first time, it is now available in print as well. Prior to today, the book has only been available on my website, as a PDF download, where it’s already helped thousands of people. Love’ em. Makes me feel good to know my work is having a positive impact upon the world. What’s So Special About the 30-Day Heartburn Solution? There are 3 primary ideas in the book that run contrary to what you hear in the media and from doctors. Your stomach is akin to a blender. Its job is to blend your food thoroughly to prepare it for points further south in the digestive tract. The acid in your stomach (hydrochloric acid) is what drives the speed of the blender. In order for digestion to work properly, the speed of the blender needs to be on high. Your stomach is supposed to be acidic. It’s the most acidic place in your body and that’s a good thing. Without strong acid production, it’s as if the blender slows down. And that’s NOT a good thing. Food does not get thoroughly digested. It sits in your stomach too long. You feel heavy, bloated, nauseous and yes, it can contribute to acid refluxing back into your esophagus. Now, unlike your stomach, your esophagus does not have a protective mucosal lining. So if some of that acid refluxes back, it burns the esophageal lining. And you experience heartburn. So the root cause of acid reflux is often acid being in the wrong place at the wrong time. NOT the overproduction of stomach acid. 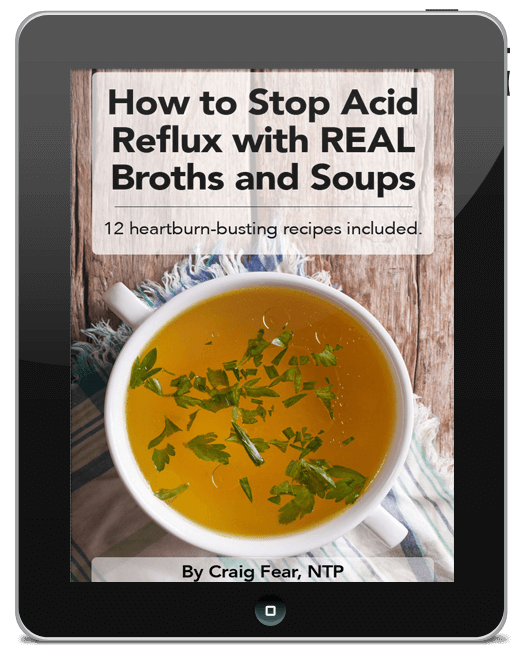 My book will show you how to boost the acidity naturally so that digestive fire is restored and acid no longer refluxes into the esophagus. Remember, the stomach is supposed to be highly acidic. While antacids and acid-blockers help temporarily relieve the burning sensation of heartburn, they perpetuate the vicious cycle of acid reflux (and other chronic digestive problems) by artificially reducing the acidity in your stomach. This is why acid-blocking medications are among the most profitable drugs in America. Furthermore, research has shown that long-term use of acid-blockers like Prilosec, Nexium and Zantac, is associated with nutritional deficiencies and increased risk of bone fractures. Even the FDA warns against their long-term use. And yet, most doctors hand these drugs out like candy, unaware of their long-term risks. The 30-Day Heartburn Solution will show you how you can stop taking these drugs once and for all. Now when I say “solve,” I don’t mean “manage.” Managing your heartburn includes common advice like avoiding triggers like citrus, chocolate, tomatoes and coffee. It also includes tips like not eating before bed and not overeating. That’s all well and good. But again, that’s not going to solve the root cause. To truly solve it, I’ll detail what to eat and why and clear up all the controversies around today’s competing dietary philosophies. You don’t have to go vegan. Nor do you have to eat soul-numbing low-fat diets. You’ll get recipes, meal plans and meal ideas to help you get started and make things as simple as possible. In fact, I break it down into 3 simple steps that anyone can follow. Ready to ditch the drugs once and for all? Ready for a REAL Heartburn Solution?